Review posted January 10, 2015. Timber Press, Portland, 2014. 200 pages. When I checked out this book, it looked familiar. Sure enough, the copyright page states, "This work incorporates portions of Seeing Trees copyright 2011 by Nancy Ross Hugo and Robert Llewellyn." Back in 2011, I checked out Seeing Trees and liked the look of it so much, I bought myself a copy. Well, the book is extra large format and heavy and doesn't fit nicely into my daily reading piles. Seeing Trees, on the other hand, is paperback and a smaller seven-inch square. I ended up reading a chapter a day most days and being completely enchanted. I would like to take it outside with me and look much more closely at the trees in my neighborhood and by my lake. Though I will probably instead settle for looking at the trees which I can see out my window and learning what the things I see actually mean. In fact, reading this book has gotten me taking far more pictures of bare branches in my walks by my lake. And now I'm noticing that each tree is different. Normally, I've always thought that winter is not the time to notice trees. After all, they're dormant then. What is there to see when a tree has no leaves? When most of us think of buds, we think of spring phenomena -- and usually in association with garden flowers. But tree buds, which contain embryonic leaves, stems, and flowers, are usually formed the summer before they grow into the forms they take each spring, and winter is one of the best times to view them. During the summer and fall, tree buds grow to a certain size then stop, or rest, for the winter. At that stage, these winter or resting buds, as they are called, remind us that life hasn't fled the body of a leafless tree -- it's just in waiting, and the shapes of next year's leaves and flowers are already programmed into its buds. Resting buds also provide one of the best ways to identify trees in winter, because their designs are unique to each species. Instead of traveling thousands of miles to see exceptional trees, as we had for our first collaboration, Bob and I decided to focus on the exceptional traits of ordinary, backyard trees. We did little traveling (unless you count walks around our own yards and neighborhoods), but we were no less impressed by what we saw. In fact, limiting the descriptions and illustrations of what we saw became harder than finding interesting tree traits to feature. Our goal in creating this book was to share the beauty of what we discovered and to get other people outdoors searching for tree phenomena like the ones we observed, because what is startling in Bob's photographs is infinitely more inspiring outdoors, where it can be appreciated in context and with all the senses. And it is in the process of discovering these phenomena in nature that the real joy of tree-watching resides. We want to convey that tree-viewing can be as exciting as bird-watching (perhaps even more exciting, if trees are your favorite wild beings) and that through intimate viewing, one's sense of trees as living, breathing organisms, as opposed to inanimate objects, will be enhanced. Above all, like most writers and photographers who value what they describe and illustrate, Bob and I hope this book will help make the world safer for trees. In my most romantic imaginings, I sometimes think that if I could just draw enough people's attention to the beauty of red maple blossoms, the extraordinary engineering of gumballs, the intricacy of pine cones -- all would be well in the tree world. That is a romantic notion. But sometimes romance can accomplish what rhetoric cannot. Look carefully at the hair, veins, pores, and other wildly vivifying tree characteristics captured in the photographs in this book, and you'll never see a tree in the same way again. Indeed, the authors have changed what I see when I walk among trees. And I'm thankful for it. 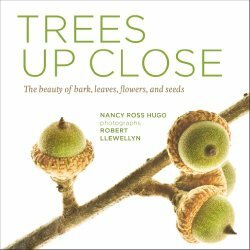 The meat of this book is the photographs -- up close, stunning photographs of many different types of trees. There are five chapters -- Leaves, Flowers & Cones, Fruit & Seeds, Buds & Leaf Scars, and Bark & Twigs. Each chapter has a short text that explains what you're looking at for this part of a tree. Then many pages of photographs give you concrete examples of what this means, and show you the variation between different types of trees. Since so much of reading this book is absorbing the stunning pictures, and since it comes in such a convenient size, it was easy to finish this book at the rate of a chapter a day. However, I will be thinking about the things I learned for the rest of my life, every time I go outside.